What happens when Egyptians, Israelis, Pakistanis, Palestinians, Americans (two by way of Romania and Rwanda), a Turk, a Tunisian, a Jordanian, and a Canadian (now living in Mexico) meet up in Sweden? They coin a new phrase. The term “inspowered” may have arisen by accident through the kind of exhaustion that comes after a week of intense project and community building, but the Fellows immediately adopted it as their own. Because inspowered (a combination of inspired and empowered) is exactly what they were feeling by the end of their time together. 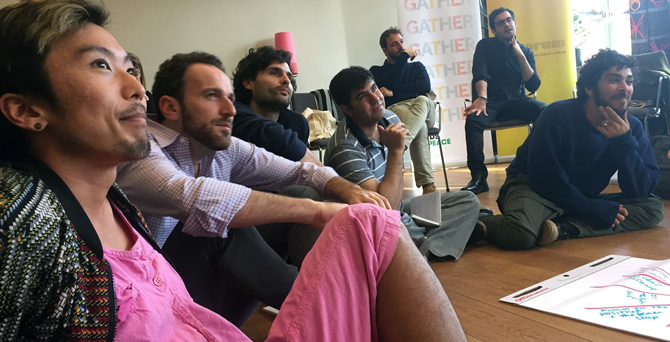 The 2019 GATHER Fellowship incubator began in Sigtuna, a small, lakeside village an hour’s drive from Stockholm. It was there that the Fellows met and began to learn about each other’s lives and life’s work. Through a needs mapping exercise and a candlelit personal storytelling session, the 16 social innovators began to realize that while leading change can be lonely work, they are not in it alone. 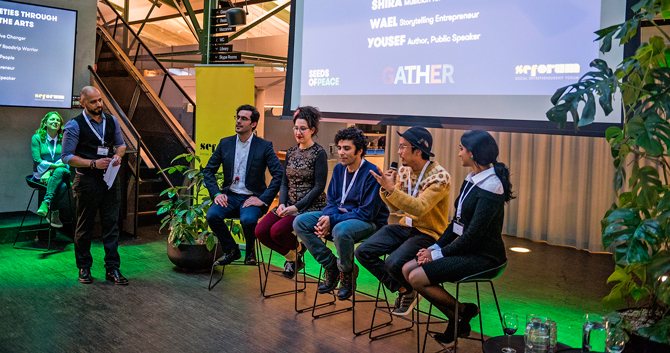 They participated in a storytelling and marketing workshop that prepared them for a speed-dating style pitch session with graduate students from Uppsala University, the Nordic region’s oldest university and one of the finest in the world. The students, who are studying conflict transformation, posed many questions to the Fellows, and were grateful to see real-world manifestations of their studies. After two days, the Fellows departed Sigtuna for Stockholm, and spent the next morning at Parliament, learning the nuances of Swedish government and meeting with four members of Parliament who graciously answered questions for an hour and a half. After lunch, they spent time in a co-working space called Norrsken House and discovered that social entrepreneurs are treated like rock-stars in Sweden. At Norssken, the Fellows explored new frameworks for utilizing the engine of business to power social change. Fellows met in small groups to workshop their projects and support each other, and they also met one-on-one with Seeds of Peace and SE Forum staff who could advise them on specific issues. On the final night, they demonstrated both thoughtfulness and thought leadership as participants in a series of panels: changing societies through storytelling and the arts, creating platforms for systemic change, bridging differences through education and dialogue, and empowering marginalized communities through enterprise. Saying goodbye was not easy. But the Fellows will meet again—every week in fact—on video check in calls. They will continue to “inspower” each other, and over the course of the fellowship, we will shine a spotlight on each of them and their projects. So stay tuned … you just might become inspowered yourself!